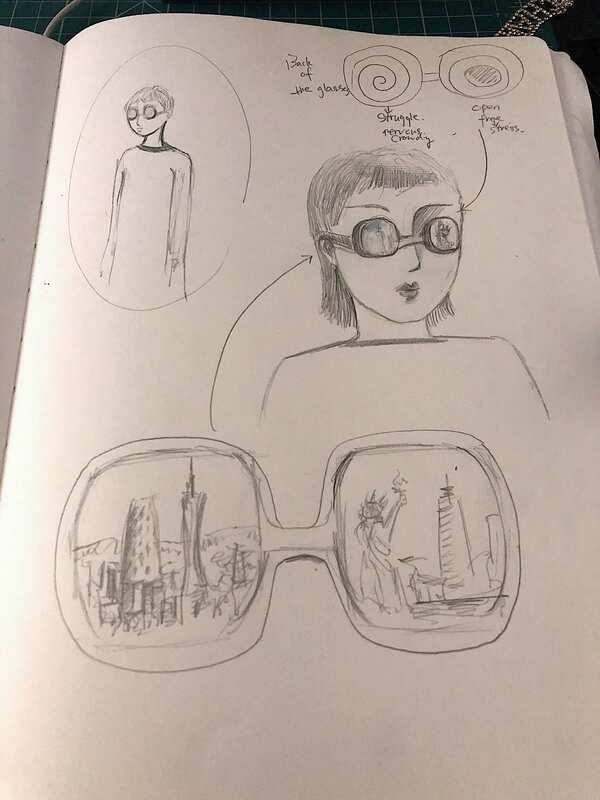 At the beginning of the project, I drew some sketches to show the status of my partner. She felt struggling, nervous when she was in Guangzhou, but she feels open and free-form stress in NYC. Based on that, I made my first glasses. It advocates freedom, dispark and calls for democracy. I used the contrast between black and white to show the strong impulse that social difference brings to her. Each glass represents a different distinctive architecture that clearly shows the city. 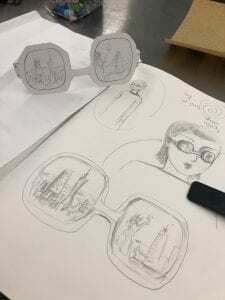 They are brought together and are put on to one pair of glasses, which shows that my partner is affected by two different cities. This one focused on the impact that the circumstances brought to her. Since this glasses can represent ideas clearly to others, but for my partner who is actually wearing it, she won’t be able to see. Thus, this shows how she was afraid to open her mind in an entirely new environment, about the culture shock that she encountered, and about the struggling that was in her mind. 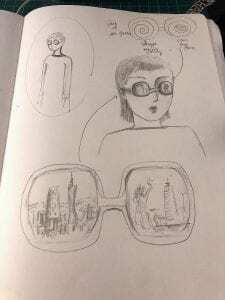 Later, I made an improvement and made another pair of glasses. 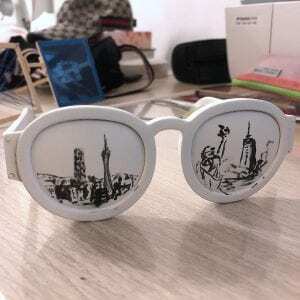 The latter pair is more abstract and is quite different from original glasses. It doesn’t have an eyeglass on one side. The outward of the lens represent two different worlds she sees. The lines on the right lens show her curiosity in the new environment. She thought that living in NYC actually gives her more freedom and the space between the lines actually provides her a direct connection with the outside world. The lines are also like leaders, guiding her in the direction to explore the world. However,the lines interacted which show a little timid part inside her, about the language issues when talking to a native speaker. I add a square on to the other lens to should that the constraint of her, like the world she can see through the sunglasses is limited. In Guangzhou, everything is well-organized but this gives her some degree of pressure to her life. Also, the dense population and buildings are also like the restriction on her life, to the way she can observe the world. 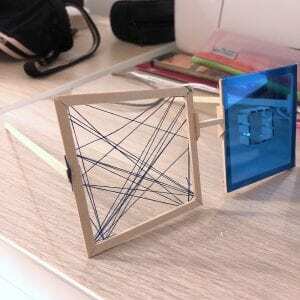 I also choose blue to build up the elements on this glasses because I think that blue is a very emotional color and feel more like my partner described in the interview. The struggle sadness or clams previous sunglasses she made was a bit of enclosure. This design has an interaction between inside and out. The subject’s emotion will change as the different colors and patterns when the subject put the sunglasses on. It was such a good time and pleasure to work with my partner. It is actually the first time I have this many times of discussions and communications with another person during a project. I also noticed the importance of the way one person present his idea to another person. It’s because sometimes I told my partner about my thoughts on a particular part of the project, she couldn’t understand my meanings right away, I tried to use some sketches and photos to present my idea on the project and it worked better than talking. I am very proud of what we have accomplished, I feel good about the design, and I am very satisfied with the whole process went smoothly from start to finish. Of course, if there is more time, we can make more improvements, but I think the design is good enough to represent the idea we tried to present. The design let us have a chance to look back to where we came from. As international students, we tried to not to look back but look forward all the time. However, the design makes me feel it is also important to look back, look at the reason why we start all of this at the first place, the original intention which motivated us to do what we are doing right now. At the same time, we also exchanged some of our designs on other ideas as well, I was been inspired by her designs and ideas and I believe she feels the same as well.